The free-agency conversation mostly revolves around LeBron James, but Paul George could arguably be the biggest chip to fall this summer. 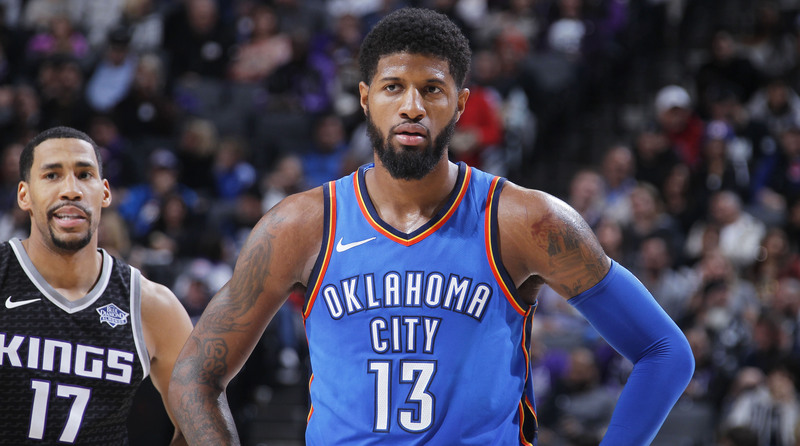 Much of the free-agency conversation has been around superstars such as LeBron James and Kevin Durant; but lost in the midst of the discussion is perhaps the biggest X-factor of all: Paul George. The Open Floor crew breaks down PG-13's best fit and which teams he should consider during the free-agency period. Editor's Note: Paul George reportedly decided to re-sign with the Thunder on a four-year, max deal on July 1. Andrew Sharp: Danny says, “Andrew and Ben, you guys must not be afraid to dream of something a little bigger this summer. At the end of your last podcast, I was wondering why do we have to stop at two superteams?” So he lays out a couple different superteams here. Superteam No. 1 is the Warriors, nothing new there. Superteam No. 2: Paul George to Houston this summer and Chris Paul re-signs. I actually think PG is the best fit for the Rockets, even better than LeBron. Superteam No. 3: Anthony Davis to Boston. AD, Kyrie plus Gordon Hayward and whatever else is left sounds like a pretty good team. Superteam No. 4: Is LeBron to Philly and J.J. Redick has to re-sign in this scenario for them to actually be competitive against the other superteams listed above. “Maybe they can even throw in a Ben Simmons trade to get more shooters. Anything is possible,” Danny says. So what do you say Ben about this scenario? I think the thing that makes me the most excited is the idea of Paul George in Houston. Ben Golliver: Well I have to hand it to Danny there. He basically named every team that is in the market for a superstar and every superstar player, so he accounted for everything Andrew. My takeaway from his extended fever dream here: Is it weird to maybe think of Paul George as sort of the biggest X-factor this offseason rather than LeBron? If LeBron stays in Cleveland, the only way he is going to get back to the Finals in my eyes is if somehow Paul George goes there. Paul George will be the single best player outside of LeBron to add to Houston. You can make the argument that Paul George would be the cleaner fit with him playing more of a supporting role and him not needing the ball quite as much. And if he went to Boston or Philly, if they strike out on LeBron and they decided to turn their attention to Paul George, those teams become really intriguing Finals candidates. Then the Lakers thing on top of all of this which is sort of the real wild card: if he goes to the Lakers and he goes there with another superstar as a package, that team is a hell of a lot more relevant than they have been for the last five years. All of this attention on LeBron and KD and what is going to happen to those guys this summer, I do think we sort of forgot about the Paul George factor. That is maybe why he decided to be “Playoff P” and “Lose Lips Paul," he doesn’t want us to forget about him when his team is out for the last three rounds of the playoffs but he is still a very, very, very good player who could turn a good team into a superteam. That is my takeaway. Sharp: It is funny with Paul George. I think the idea of Paul George fits so perfectly on like five different teams. The reality of Paul George is a little bit trickier. This wasn’t a great year for him in OKC and him maxing out his potential depends on much he is willing to embrace the rich man’s Iguodala role vs. being poor man’s KD or poor man’s Kobe somewhere. I think one of the things that make him and Houston attractive is the idea of him not really having an option. The ball is going to be in Chris Paul or James Harden’s hands and then he becomes twice as dangerous operating on the wing and those guys are going to be able to get him the ball in places where he is comfortable in ways Russell Westbrook wasn’t really able to do. So that would be fun as hell. My biggest hope for the next few weeks is that Houston has the ability to trade Ryan Anderson before July 1st. It is a big question mark. That would shock me if a team is willing to take Ryan Anderson and three first-round picks that will likely be in the 25-30 range from Houston. If they can clear that space, then free agency gets several more measures insane. Paul George, I agree with you he would definitely make Philly more attractive if that's where he ends up and LeBron has to try to suddenly engineer his way there. For the Lakers, LeBron and Paul George might not be enough but I think at this point we may be downplaying how good they can be together out there. The Lakers would still have more room to wheel and deal around them. So it is all on the table right now.